Born in the charming Old World city of New Orleans in 1948 Jerry developed his interest in art after watching a PBS program on Jackson Pollock. That inspired him to do his first canvas of colorful lines and blotches that was displayed in his family den for several years. It has since been lost. Over the years he experimented with other media-silk screen, photography, assemblage, but college, military, family, and work concerns took him away from art. After his wife died of cancer, Jerry retired from his law practice to do what he likes, cooking, canoeing, and art. After taking additional art classes he again tried assemblage then began painting his children from photographs. With encouragement from friends, he tried other subjects as well, including adaptations of Gauguin and Van Gogh. Finally, Jerry found his own personal style of painting, using acrylics in a Post-Impressionistic flare of bold colors and wavy lines. Generally he creates small images on paper but he also produces larger canvases. He prefers painting from photos taken on his travels but also paints portraits on commission. Contact Jerry by e-mail for more information. 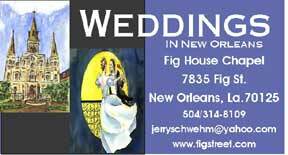 He also manages New Orleans' Fig Street Guest House where his art is shown. His art is also sold at several shops in New Orleans. Call him for information.